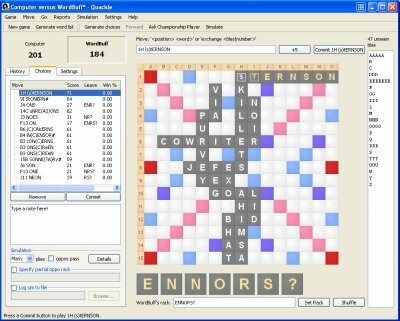 A Scrabble Helper is any tool that helps improve your Scrabble game (transl. CHEAT!). I'm going to introduce you to three sensational Scrabble tools that will make your games more enjoyable, and give you a huge edge over your opponents. Incredibly, they are all FREE! Here is a very handy widget for resolving lounge-room Scrabble disputes over whether a word is valid. Just type your word in the space provided and click CHECK. After a short wait of a couple of seconds or so, a message will pop up saying either ALLOWED or NOT ALLOWED - dispute resolved! NOTE - This widget uses Collins Official Scrabble Dictionary , which is the word-authority everywhere in the world except North America. So if you want to play to the North American dictionary (which is a slightly smaller subset of the one above), you'll need to wait until I've tracked down a reliable widget for you. Then again, it might well be quicker to just get yourself a physical copy of the Official Scrabble Players Dictionary , which presides over North American Scrabble. Quackle is a Scrabble helper that you can set up to play and critique Scrabble games. As an artificial intelligence and analysis tool for Scrabble players it is, quite simply, the best there is. And what's more, it is totally FREE. In the left hand panel you'll find most of the analysis tools. Here you can list all the possible plays available for a given move, and get an estimate of the likelihood that each of those moves will win the game from the current position. You can play against the computer at a range of skill-levels, and you can even have Quackle generate a detailed report on the quality of your plays! You can find out more about Quackle (like, where to get it, for example!) here. When it comes to word-study, Zyzzyva has been hailed by serious Scrabble-buffs as the best thing since sliced bread. And once again, it is completely free. Rather than bore you with some of the basic word-finder stuff you've probably seen before, I'll show you how to use Zyzzyva to do something a little more off the beaten track. Suppose you've noticed that you keep missing bonus words with five or more vowels. 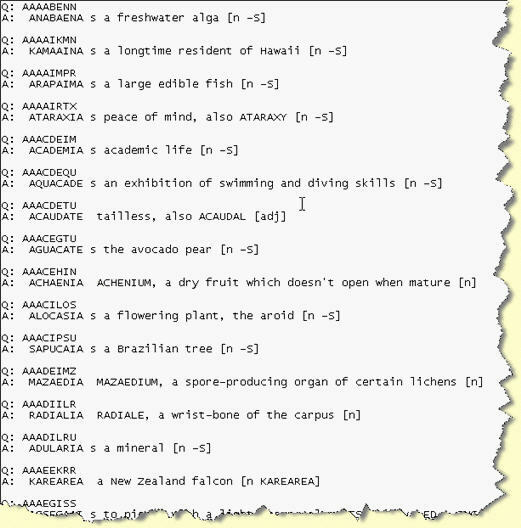 You want to produce a list of all such words, and you want to format it as a quiz to test your anagramming skills. Also, for each answer, you want to know the front hooks, back hooks, and even the definition of the word, to help solidify it in your mind. Actually, even though Zyzzyva is very popular among Scrabble players, it is not in any way restricted to Scrabble - you can use it for just about any word game you like, or just to improve your vocabulary. You can download Zyzzyva here, or if you'd like to learn more, you can read my interview with Zyzzyva's creator.